Designing Digitally, Inc. is proud to announce they have partnered with Auburn University Food Systems Institute to provide a 3D animated, HTML5, web-based E-Learning simulation that teaches learners how to perform standard practices for Polymerase Chain Reaction (PCR) and Gel Electrophoresis within a lab. We strive to provide clients, like Auburn University, with a product they can use and are proud of. 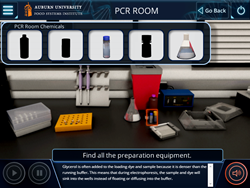 To help students better understand the PCR process and lab etiquette, Auburn University requested an E-Learning simulation that would walk users through each step of the procedure. Breaking the simulation into three separate rooms, each with a specific task and focus and representing important phases in the course, students are guided through the PCR and Gel Electrophoresis processes. Students first start the simulation by entering the Antechamber, where they must ensure they are wearing the proper safety equipment before entering the Clean Room. Once in the Clean Room, students are guided through the process and proper lab techniques of gathering their samples and preparing them for PCR. Finally, they enter the PCR Room, where the actual procedures of PCR and Gel Electrophoresis take place. Students are required to go through each detailed step, including safety equipment, sanitation, and proper disposal of used equipment. Detailed 3D animations and custom designed interactivity give students the ability to experience the lab and the technique of performing PCR before entering the actual lab. Repeated exercises help ensure students are familiar with each important aspect of work inside the lab, reducing likelihood of mistakes. Students are also able to see detailed animations of what happens during the PCR process itself, providing them with a better understand of what PCR is and how it works. The simulation is provided to students by professors and is an integrated part of their lessons. Bookmarking and scoring allow professors to easily see when a student has completed the course and are ready for the next step in their education. Auburn University Food Systems Institute will be providing this 3D Simulation within their Canvas Learning Management System. You can read about the project in detail by reviewing the case study here. Designing Digitally, Inc. is a full-service interactive design firm and E-Learning developer. Located in Franklin, Ohio, Designing Digitally, Inc. has developed a number of Serious Games and Simulations, Virtual Worlds, and E-Learning solutions for companies around the country and the globe. Designing Digitally Inc.’s overall goal is to add value to the clients that they serve by creating engaging, educational, and entertaining learning solutions.